My family absolutely loved these cookies. They aren’t as sweet as sugar cookies, but they have a gentle sugary taste that will make you melt. They are chewy, and I’ve always been a chewy kind of girl, so I’m fine with that. But mostly, I think the batter is miraculous. This is mostly because this is one of the very few batters that I can eat raw without the annoying risk of salmonella, because the eggs can be (and were) substituted with milk. Oh, the joy, wonder, and pleasure. If you’re wondering about the single cookie in the picture that has a brown dot, that is an M&M. My dad insisted on having one on his cookie, so i popped one in there a few minutes before they were done (I suppose his is now the special cookie!). Hey, he’s my father. What can you do? Anyways, these cookies were a snap to make, and, as you already know, were probably invented just for the sake of being deeply loved. I loved home economics class in the 3rd marking period, and I thank my home ec teacher for giving us this recipe. You’re awesome! 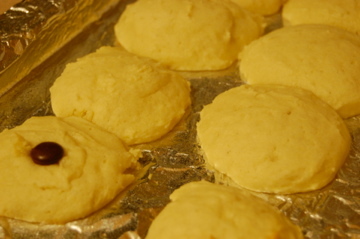 This entry was posted in Uncategorized and tagged cookies, ricotta cheese. Bookmark the permalink.